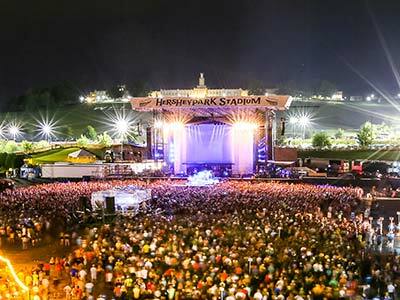 Opened on May 18, 1939, Hersheypark Stadium is a football, soccer and concert arena, and is located in Hershey, Pennsylvania, U.S.A., on the grounds of Hersheypark. The summer home of the Philadelphia Eagles, as well as the site of rodeos, athletic and music competitions, concerts, pageants, and racing events, Hersheypark Stadium was even the host of a birthday gala for President Dwight D. Eisenhower in 1959. Over the years, the stadium has seen a wealth of talent of its stage, including acts such as: Ariana Grande, Beyoncé, Black Sabbath, Bruce Springsteen, Coldplay, David Bowie, Fleetwood Mac, Grateful Dead, Jay Z, Paul McCartney, Red Hot Chili Peppers, Rihanna, The Rolling Stones, Toby Keith, Whitney Houston and many more!